The largest Amazon tablet to date has finally started making its way to customers. Announced on Sept. 6, the Kindle Fire HD 8.9 has begun shipping to the customers who pre-ordered one. Since that time the shipping dates have been slipping, and if you order one today you can expect it to arrive around Dec. 3 at this point. Still plenty of time for Christmas, however, if you’re looking to pick one up for a gift. The 8.9-inch tablet has a 1920×1200 HD display, a 1/5Ghz dueal-core processor, dual-band Wi-Fi, integrated e-mail support and a whole lot more. It also ties you in deeply to the Amazon ecosystem, so if you purchase or rent videos from there, but music or have a growing library of Kindle books, you’re all set. We’ll have an unboxing and review of the tablet very soon. SEATTLE–(BUSINESS WIRE)–Nov. 15, 2012– (NASDAQ:AMZN)—Amazon today announced that Kindle Fire HD 8.9”—the large-screen version of Amazon’s best-selling HD tablet—ships today, just in time for the holiday shopping season. Customers can order their Kindle Fire HD 8.9” atwww.amazon.com/kindlefirehd for $299. Kindle Fire HD 8.9” is also available at Best Buy starting tomorrow as well as additional retailers like Staples and Radio Shack in the coming weeks. Kindle Fire HD 8.9” 4G will ship next week. A vibrant 8.9”, 1920×1200 resolution display at 254 ppi. Dual antenna, dual-band Wi-Fi with MIMO technology for faster streaming and downloads. The latest generation TI OMAP 4470 processor and Imagination SGX544 graphics engine capable of over 12 billion floating point operations per second. Dual stereo speakers with Dolby Digital Plus audio—the standard in high-end audio—available exclusively on Kindle Fire HD. Exceptional battery life—Kindle Fire HD 8.9” gets 10 hours of battery life. Front-facing HD camera for taking photos or making video calls, including a custom Skype application for free video calling from around the world. The new Kindle Fire HD 8.9” 4G, with groundbreaking 4G LTE data package, starts at $499 and will begin shipping on November 20. 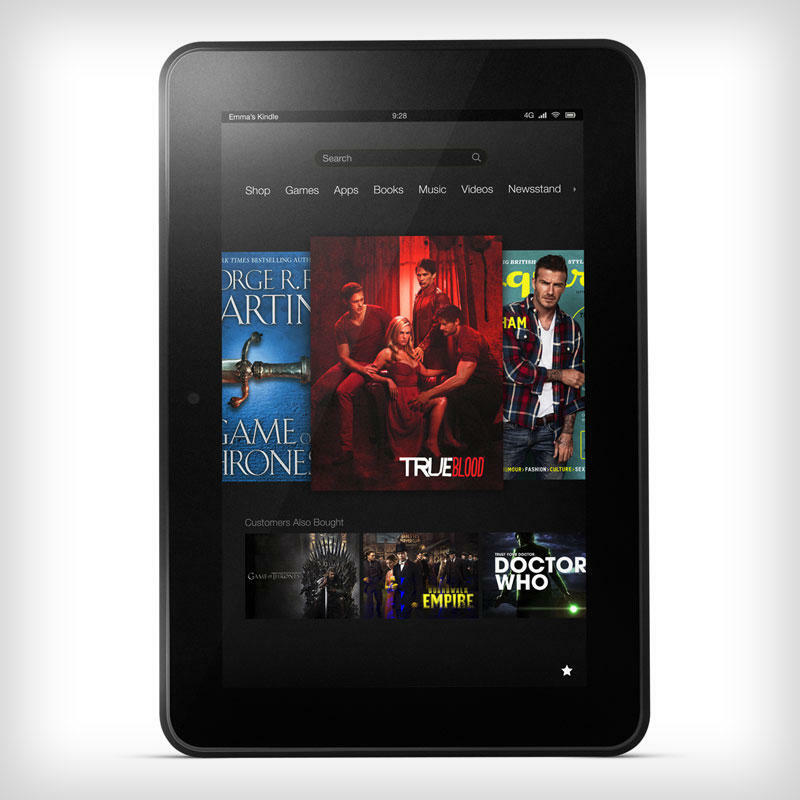 Amazon worked closely with AT&T to offer the most affordable 4G tablet data package. The 12-session AT&T 4G data package includes 250MB a session of data, a $10 Amazon Appstore for Android credit and 20GB of Amazon CloudDrive, all for a one-time payment of only $49.99. There are no monthly fees or annual contracts. The $49.99 package is only available for the first year of service. Customers can also choose to upgrade to 3GB or 5GB data plans from AT&T directly from the device. Kindle Fire HD 8.9” features the latest 4G LTE technology for ultra-fast mobile broadband, letting customers connect to the internet, stream, and download at speeds even faster than Wi-Fi. Unlike some 4G devices, Kindle Fire HD includes support for 10 bands, so even when a customer is in a place with no 4G LTE network they’ll fall back to the fastest available network and won’t lose coverage. All this with no compromises to battery or weight – Kindle Fire HD combines the most power-efficient LTE chipset available with a custom-designed 4G wireless modem that’s only 2.2 mm thin. Customers can learn more and order at www.amazon.com/kindlefirehd. Kindle Fire HD 8.9” is also available at Best Buy starting tomorrow and will also be available at additional retailers like Staples and Radio Shack in the coming weeks.